It is our mission to make every customer a ‘customer for life’. 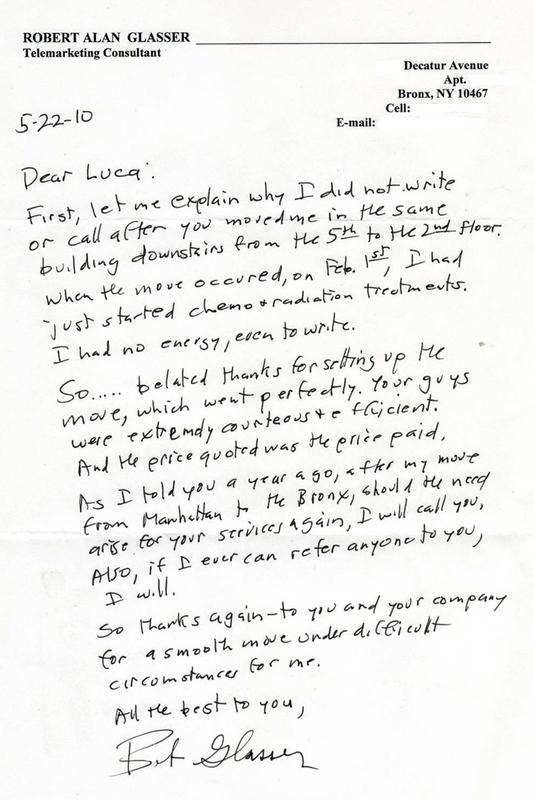 That is why customer service is at the top of our priorities. 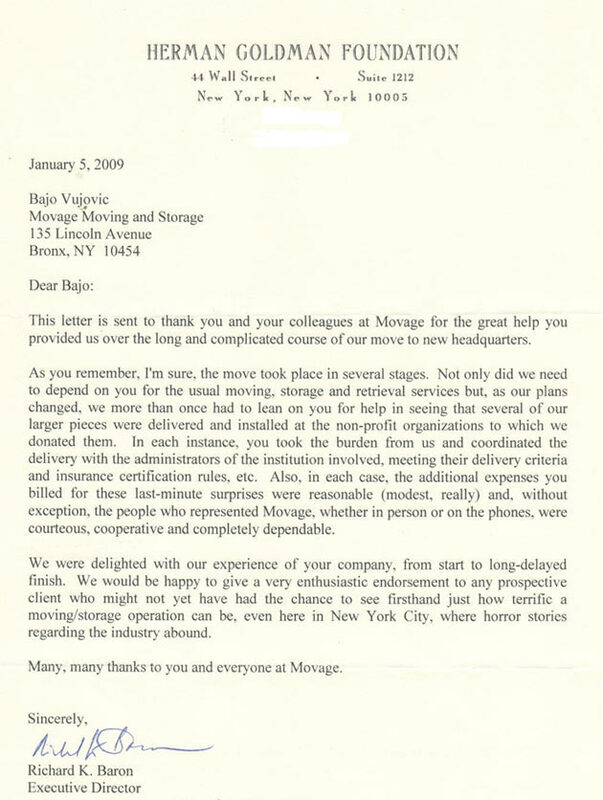 I have worked with them on a variety of events that have included many different event elements and without fail Movage has consistently been fantastic… They are most trustworthy and reliable moving company I have dealt with in my many years in the fashion event industry. 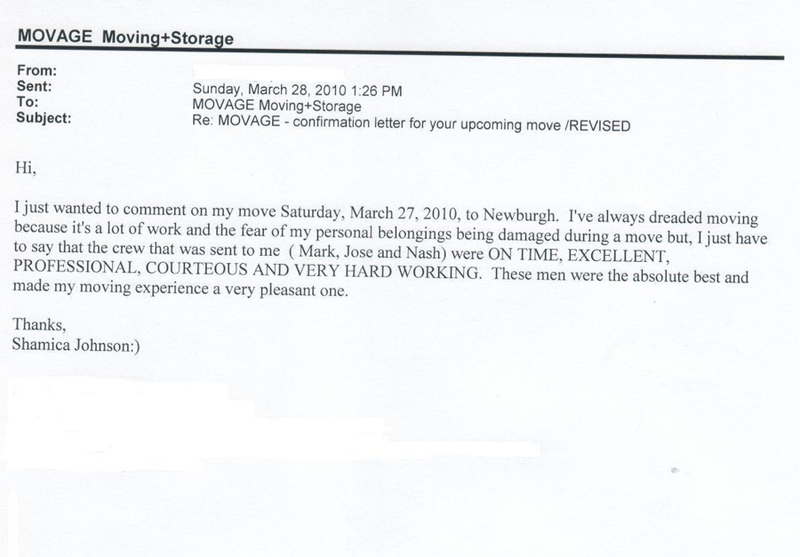 In many other instances, I have worked with rude and inconsiderate on-site movers, but Movage has always provided me with polite and friendly on-site staff… Most importantly they are budget conscious and always strive to work with any event budget… I will continue to use them for all of my moving needs in the future. It is not often that I find myself so impressed by the service of an organization that I take the time to say thank you. 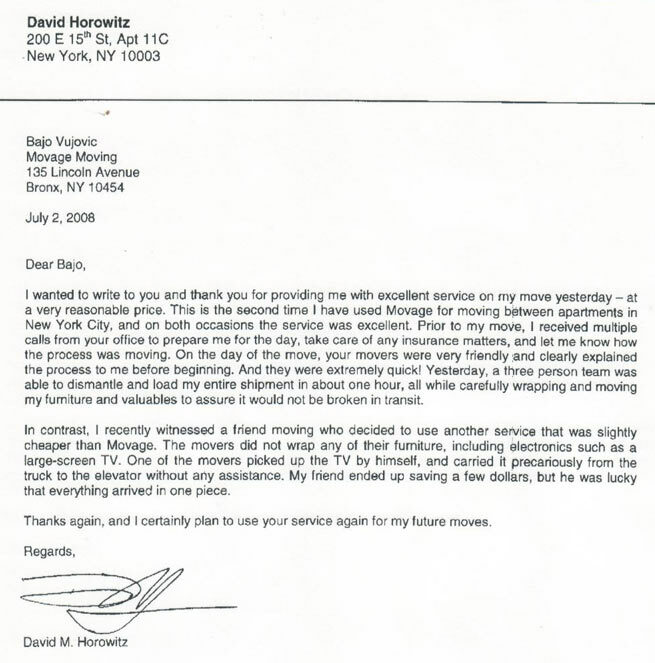 In this particular case, I find myself having to extend my thanks for a multitude of occasions we utilized Movage for…You are a company that provides service, care, professionalism, price…in all, you were able to meet all our needs…You will remain my “go-to” moving company and I will highly recommend you to anyone who is looking for a superior moving experience. 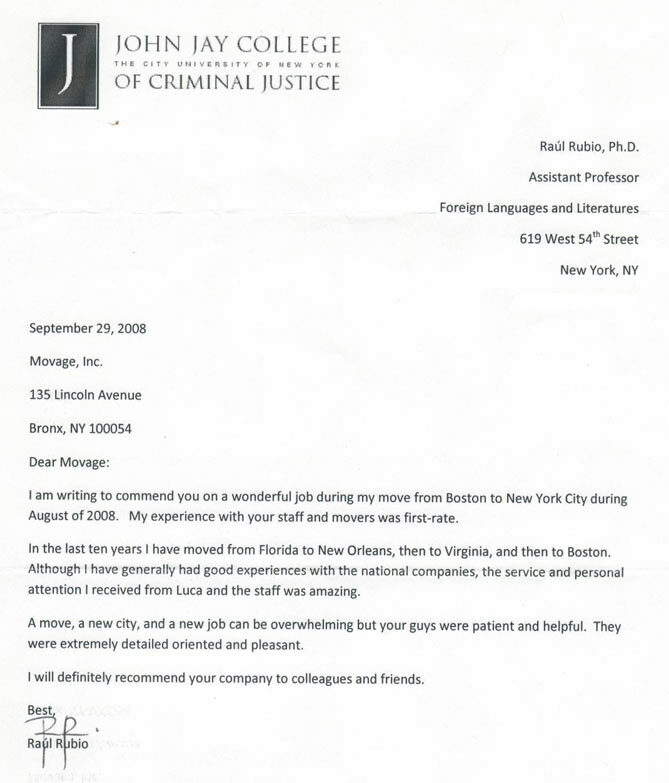 I want to commend you and your team for being a consummate professionals from start to finish…I’ve had more than my fair share of unpleasant ‘moving’ experiences and it’s refreshing to know that there are still companies that care about customer service…You can rest assured that, should the need arise, you will hear from me as I wouldn’t hesitate to enlist your services. I wanted to express what a great experience my wife and I had… The crew was on time, efficient but very careful… We had several very large items which we thought would be a problem, yet the guys took care of them with minimum fuss. 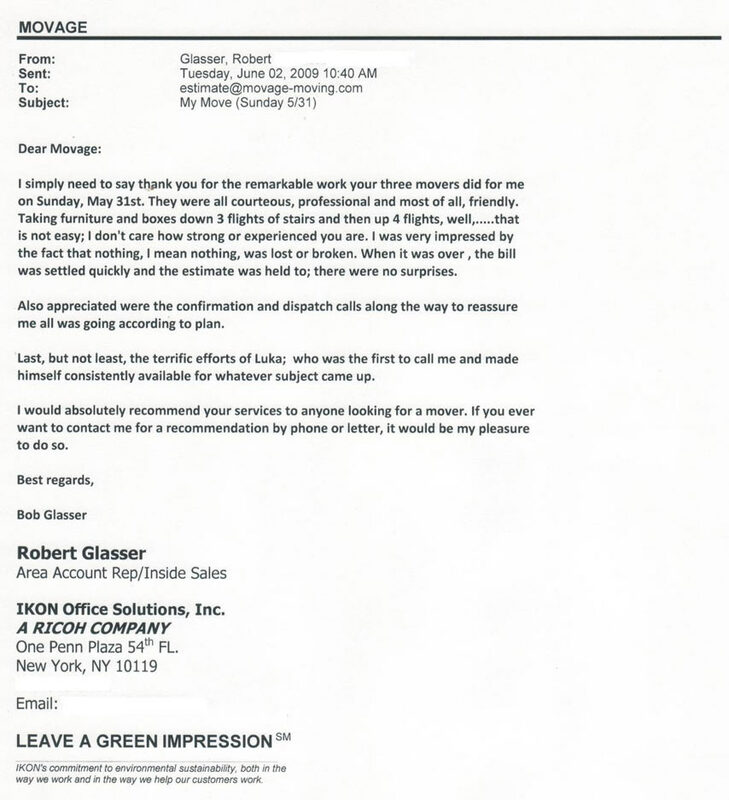 We were also very happy to see that the price quote was exactly what we paid. 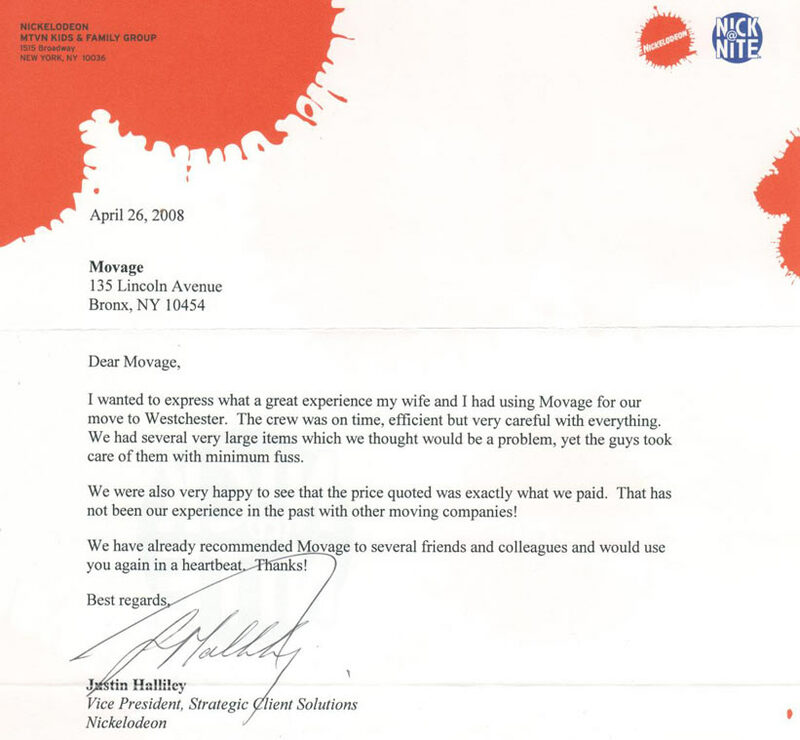 That has not been our experience in the past…We have already recommended Movage to several friends and colleagues and would use you again in a heartbeat. Thanks! I don’t think anyone could have done better—they were great on all counts! ….and we have already referred them to three people. And will continue to do so. They did all the packing for me and when I arrived at my new home I discovered that not one dish, mirror, bottle or frame poster was broken…I was very happy with the overall service. …From our first interaction, review of your web site and up-front business approach, the professionalism was very evident…The team made us feel very comfortable right from the on-time arrival with a friendly and professional attitude. 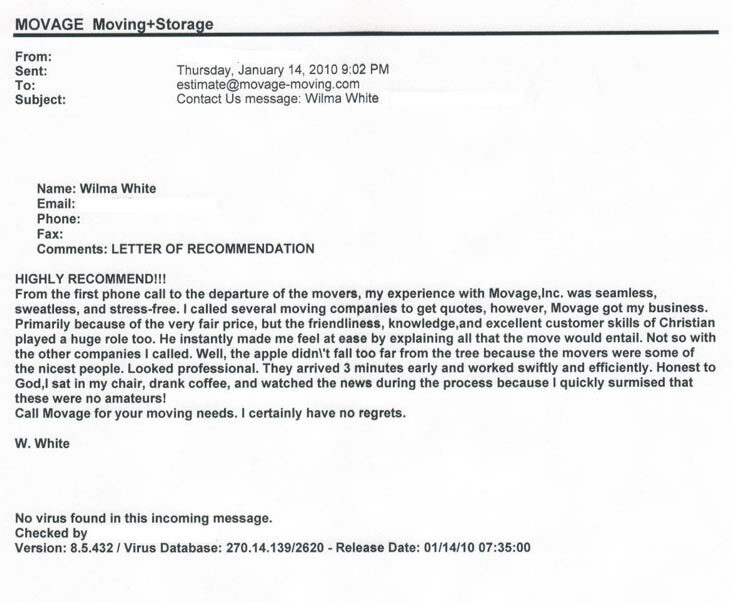 They showed their experience level in every aspect of the load and unload process with overall efficiency and careful attention to detail that we appreciated. 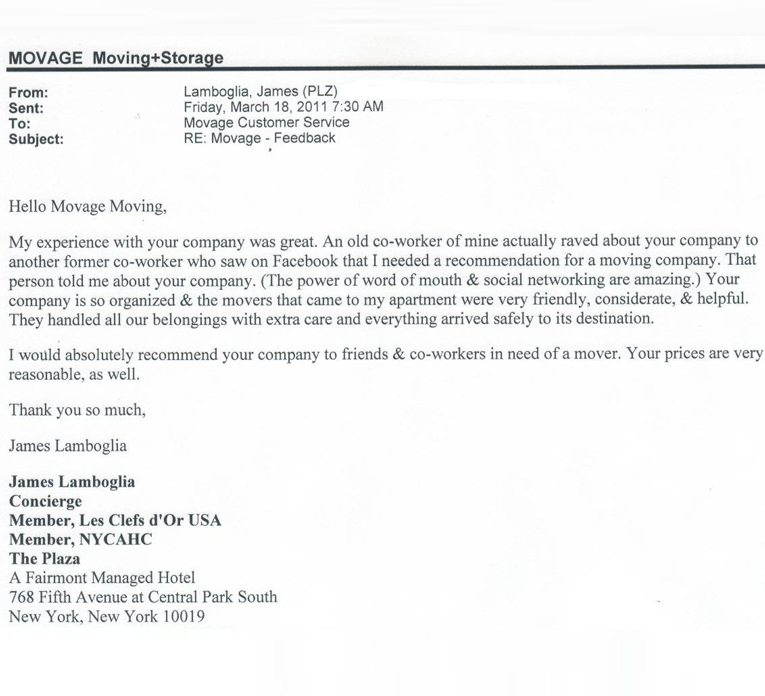 We would highly recommend Movage to others as a great company to do business with and in providing a high level of customer satisfaction. 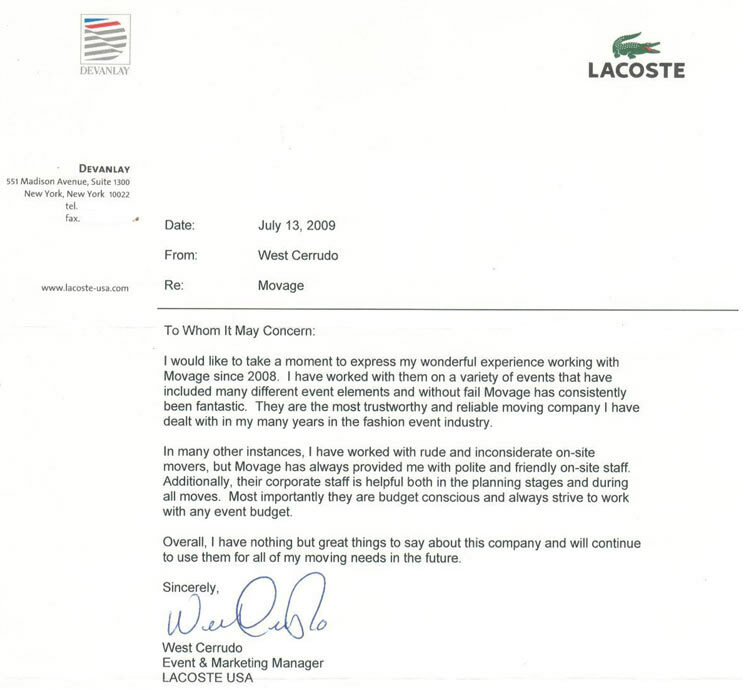 ….The crew you sent was very professional and careful with all of my items (and, believe me, I set a high standard!) 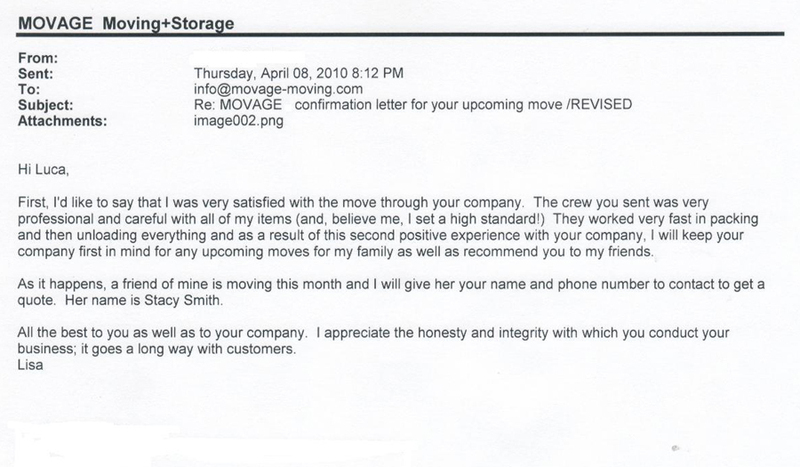 They worked very fast in packing and then unloading everything…I will keep your company first in mind for any upcoming moves for my family as well as recommend you to my friends…I appreciate the honesty and integrity with which you conduct your business; it goes a long way with customers. …I’ve always dreaded moving because it’s a lot of work and the fear of my personal belongings being damaged… I just have to say that the crew that was sent to me (Mark, Jose and Nash) was ON TIME, EXCELLENT, PROFESSIONAL, COURTEOUS AND VERY HARD WORKING. These men were the absolute best and made my moving experience a very pleasant one. 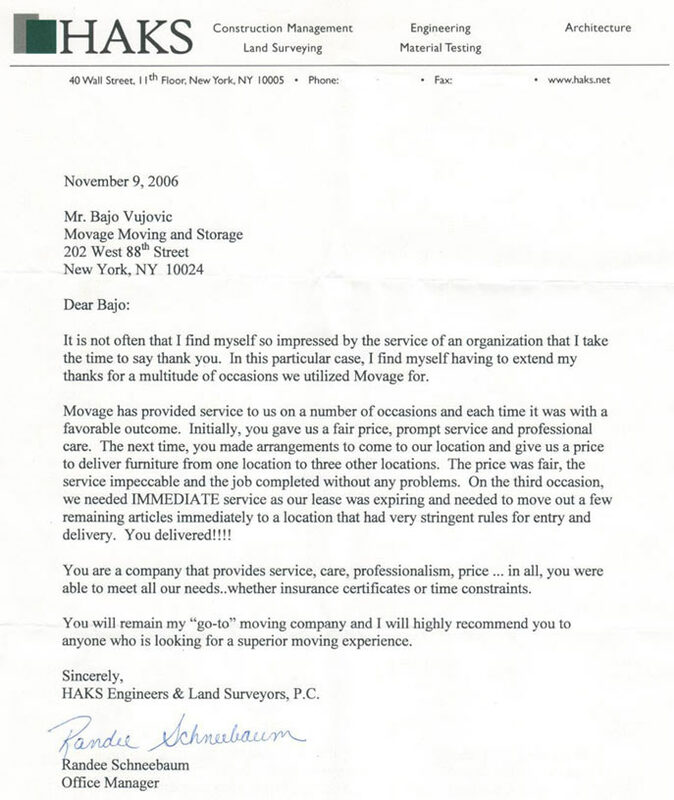 … The respect and care they have taken with my property was truly appreciated and acknowledged. 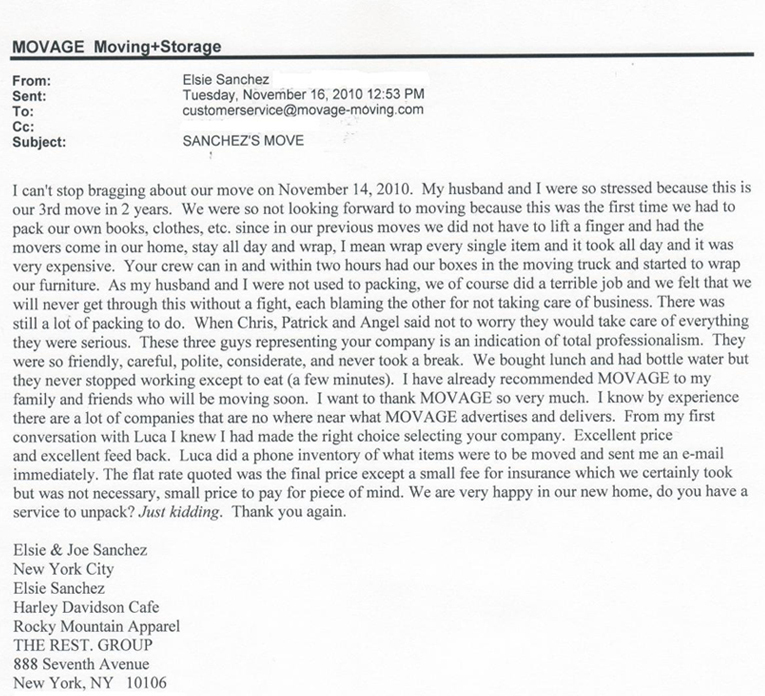 I will definitely recommend Movage Inc. to family and friends and would use you again. 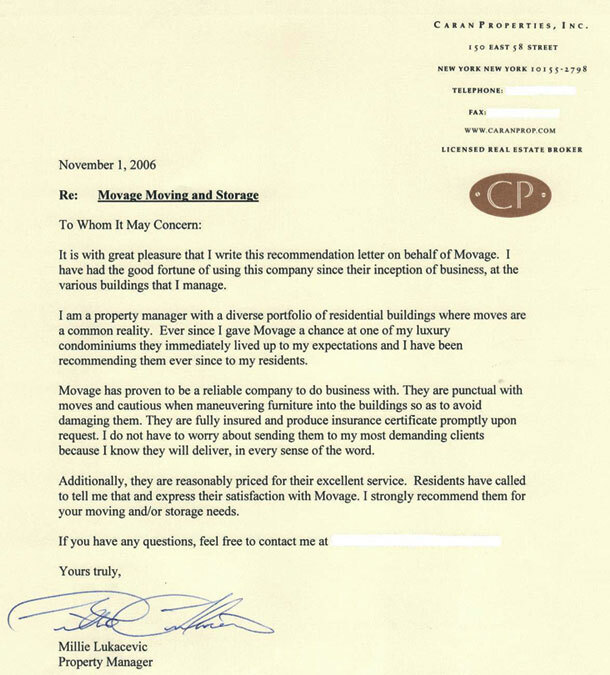 …My brother has used movers in the past, but he found your service to be leagues above that he had received from other companies. 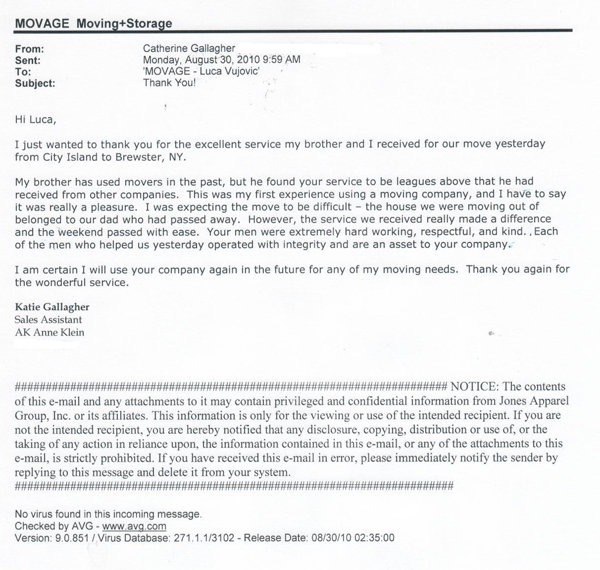 This was my first experience using a moving company, and I have to say it was really a pleasure. I was expecting the move to be difficult … the service we received really made a difference and the weekend passed with ease. Your men were extremely hard working, respectful, and kind. Each of the men who helped us yesterday operated with integrity and are an asset to your company…Thank you again for the wonderful service. 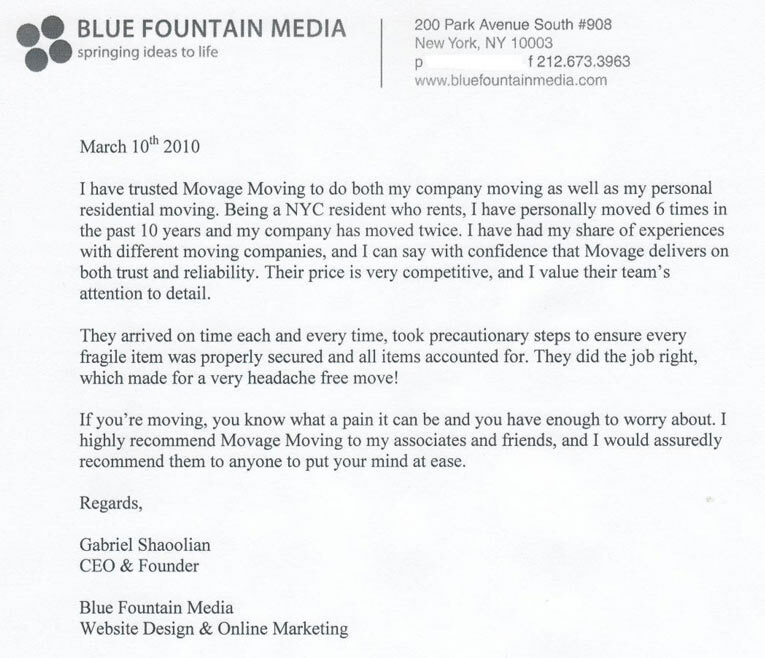 I especially want to thank you for your flexibility with your scheduling; since we had to change our move at the last minute…we will definitely recommend your services to our friends. It was a day that we thought would be messy, confusing, and frustrating in every sense. However, it turned out to be a day that was easy going and professionally handled. 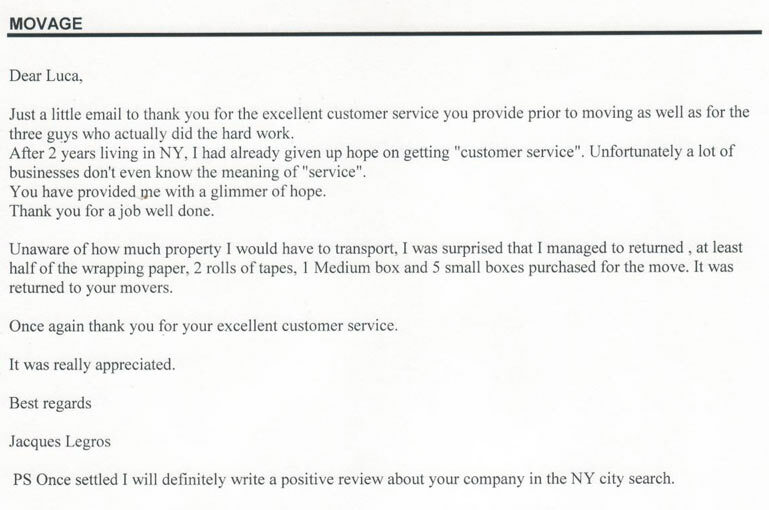 The movers you sent to us were experienced, friendly, courteous and always had a smile. If I changed my mind where something was to be placed, they did it without any comment. 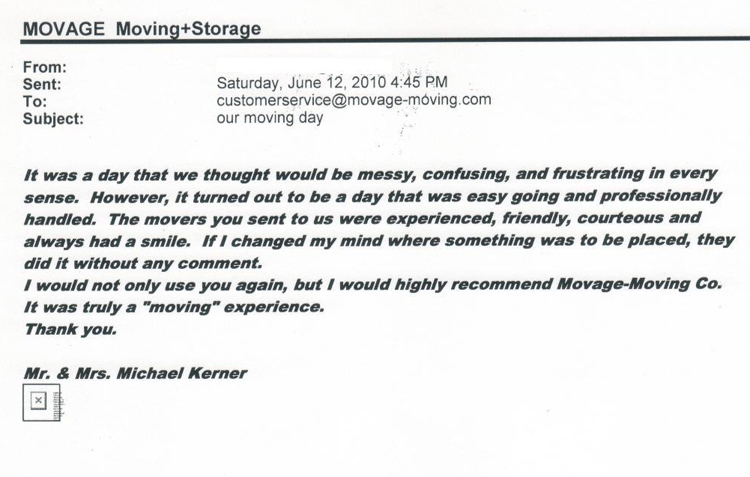 I would not only use you again… It was truly a “moving” experience. Thank you. 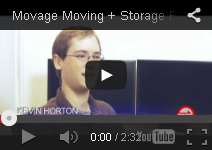 …Movage did such a terrific job moving us from Brooklyn to New York. The team, led by Patrick, was courteous, efficient, professional and super kind. 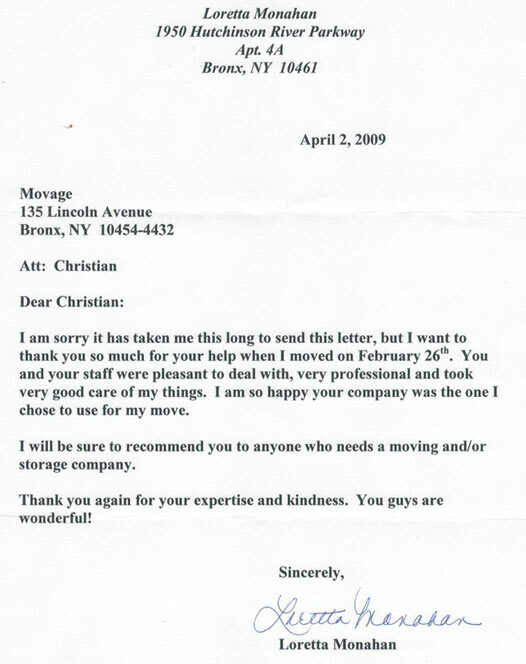 Moving is most stressful, your team made it so calming… I will most definitely recommend Movage and should we need moving services in the future, you will be the one we call, for sure. 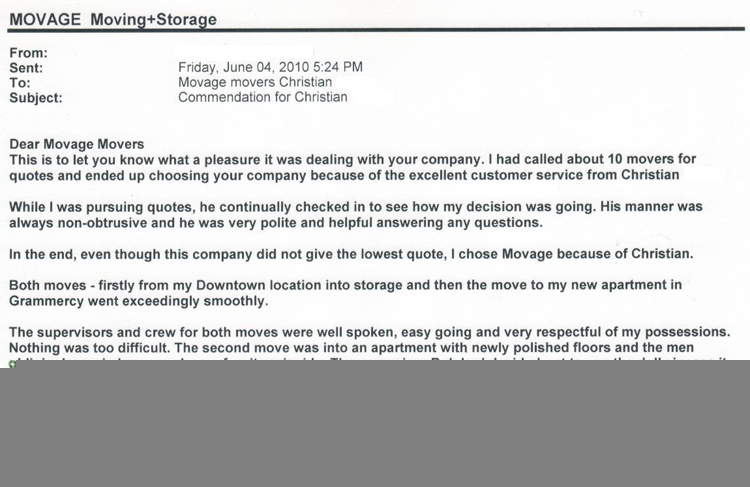 I wanted to write and say thank you for the excellent service we received from your salesman Christian and your moving foreman Patrick and his crew… Due to unanticipated delays with my closing, I was forced to reschedule my move three times. Each time, Christian was polite, responsive and quick to meet my needs. … The team of guys led by Patrick who did the actual move worked with incredible speed and efficiency. 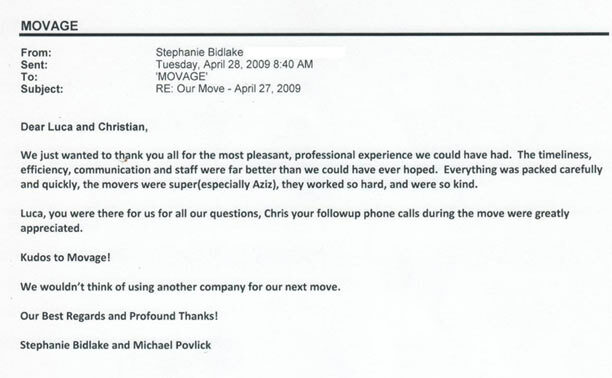 We were impressed by their diligence and unflagging efforts over the course of a long day… I couldn’t be happier with the job that everyone did, and I will be both using Movage for any future moves, and recommending Movage to anyone I know in need of movers. 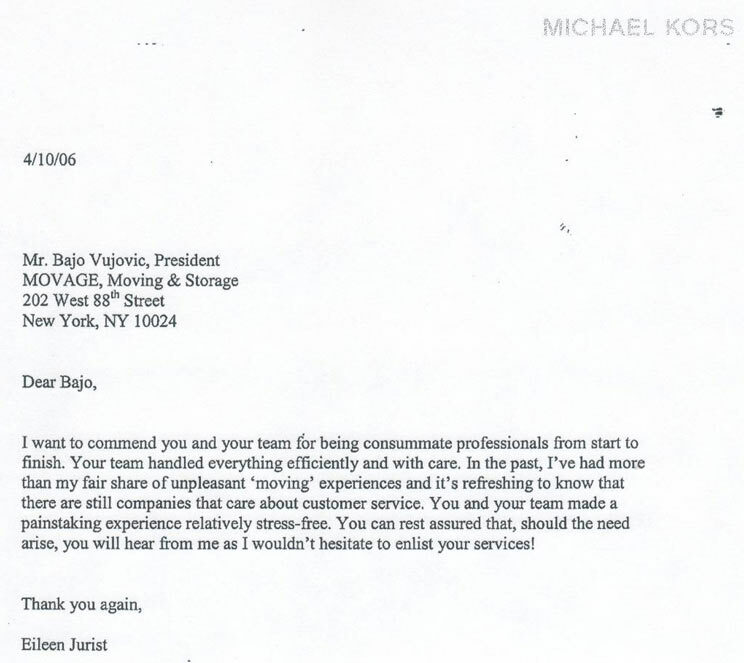 You and your staff were pleasant to deal with, very professional and took very good care of my things. 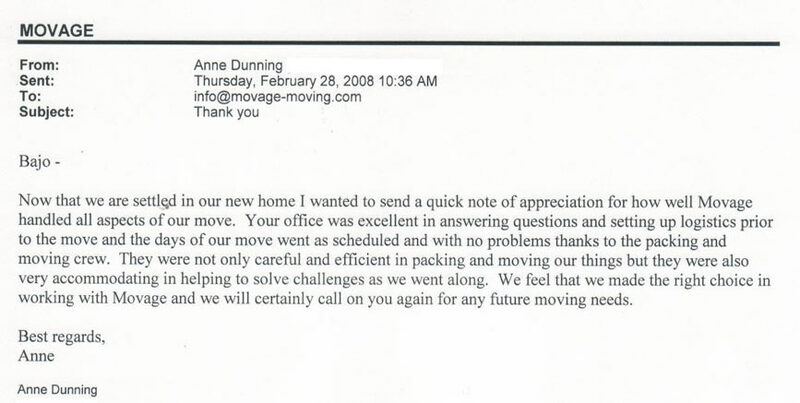 I am so happy your company was the one I chose to use for my move. 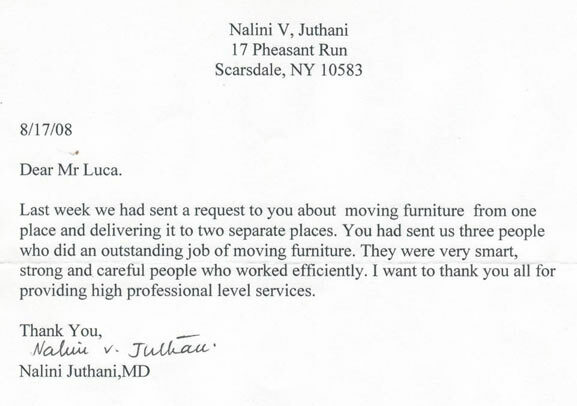 You had sent us three people who did an outstanding job of moving furniture. They were very smart, strong and careful people who worked efficiently. 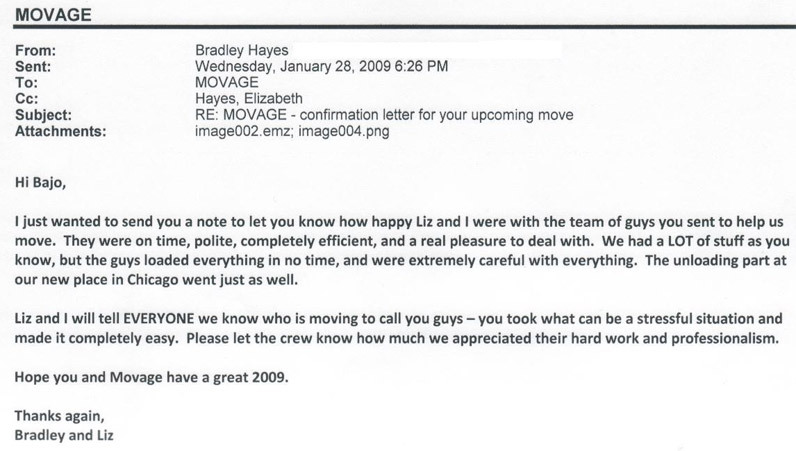 …your movers were exceptionally professional and completed my move rather quickly. 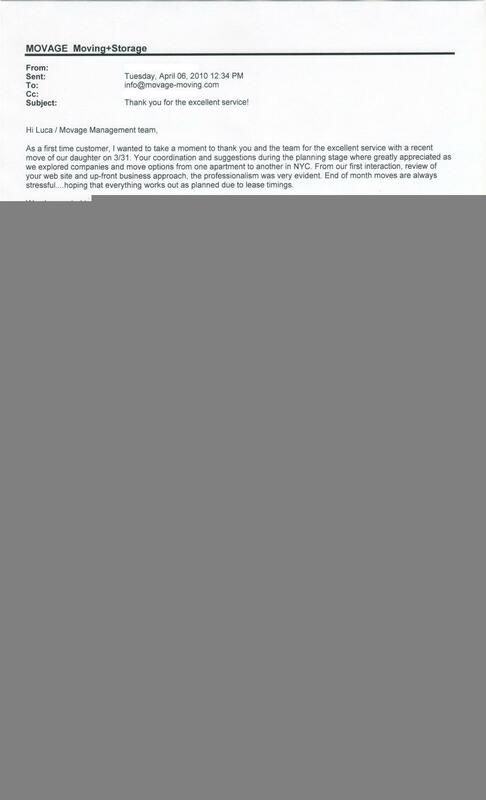 They handled my property with great care and I was very pleased with the entire service. 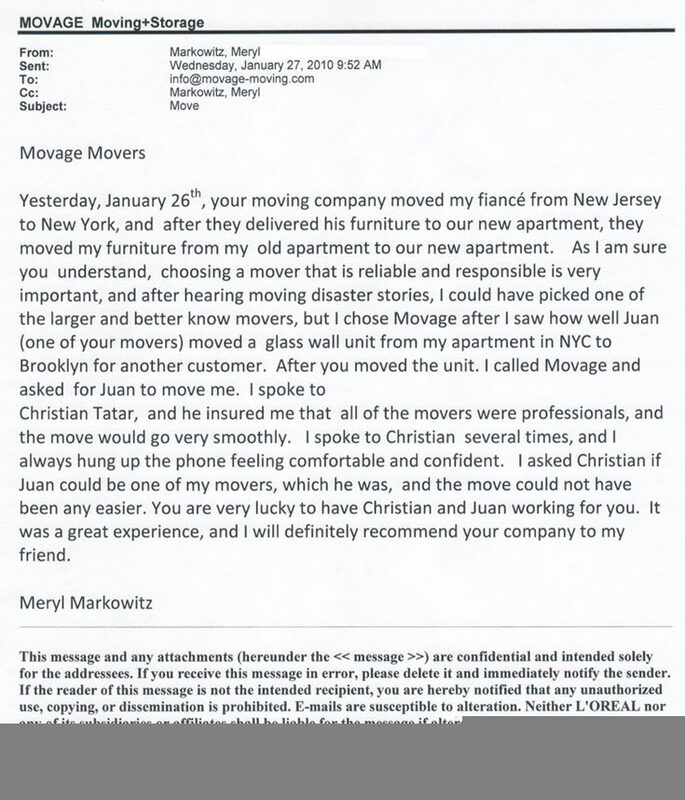 This is the second time I have used Movage for moving between apartments in New York City, and both occasions the service was excellent…. 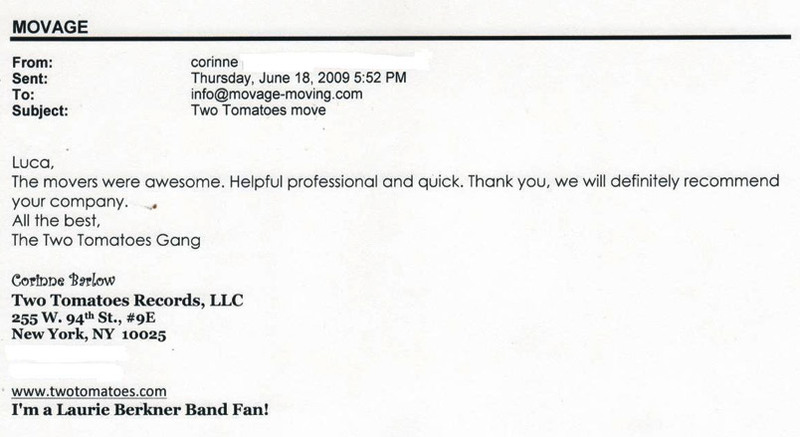 On the day of the move, your movers were very friendly and clearly explained the process to me before beginning…Thanks again, and I certainly plan to use your service again for my future moves.